Peace be to you from God our father and our Lord Savior Jesus Christ. It is always a joy for me to share what God is doing in Nepal and thank you for your love and prayer. I notice that I have not made any update for quite long. I have some stories and I would like to share them with you. Look at this wonderful white building in the middle of the field. Is not this beautiful? I look to this building and start to imagine how good God was over the past who helped us cross so many obstacle. It will be complete very soon and the orphans will start to come but there is a prayer we need to pray. We have thirty Children now and we will very carefully select who will go here. I want to thank for each person who helped us put the brick in the wall. I really appreciate all. There are furniture need to be put, bathrooms and others need to set up. I believe God will give us everything we need for this orphanage. I want to read the passage we all read, about children. Jesus said, let the children come to me. Don't stop them. For the kingdom of Heaven belongs to those who are like these Children. 'Mathew 19:14. In summer we had to stop working because there was great flood that really damage south part of Nepal and the Orphanage is in the south part of East Nepal. We have come to this far and there has been many up and down, but thank be to God who brought this dream into reality. We need your prayer for the paper work for the registration of orphanage that it will go ahead as God wills. This is first layer of painting, and when painting is fully done, it will look beautiful. We distributed Bibles to Sherpa People in Taplejung. Early morning, we heard people sing hymn, we wake up and followed the song. We reach a small home covered with aluminium all around. We saw people sitting around, knelling and singing. They look to us as we stood there in the door. They gaze at us as we stood in the door. We said 'Jai Mashi' and immediately their face was turned with smile and responded Jai Mashi. We told them we heard you sing and we came to visit you. They were so happy and we gave them Bibles and Christian song book, they became very happy. They didn't have Pastor in their Church but there was young man named 'Pasang' who was leader to them. They all came from the mountain, who above 3000m in altitude, mostly Sherpa. We encouraged them and prayed for them, return back to hotel to prepare for the soccer game. We had team come from Teen Mission aged 13-18 and they helped us build a separate kitchen house for orphan kids and some room for the guests. I really appreciate for their hard work. They bought the materials and worked themselves. What a privilege. I would like to have more teams come to Nepal and help us in orphanage, in school and in Church in Nepal. 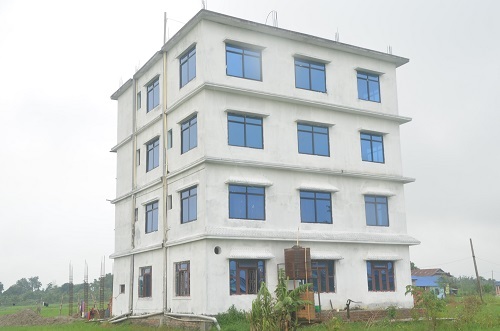 House Churches in Nepal is increasing every week and every months. But, there has been tremendous pressure and restricting law being made against Christians in Nepal. On 17 Oct 2017, president of Nepal passed the bill saying any attempt to convert someone from one religion to other is offensive crime and guilty of hurting of religious sentiments and any Christian should face 6 years of imprisonment. Nepal paints herself as religious tolerance, secular state and freedom of religious speech but it's not, so you need to pray for the boldness of Christians in Nepal to grow stronger. I know God loves Nepal and He wants many to be saved. 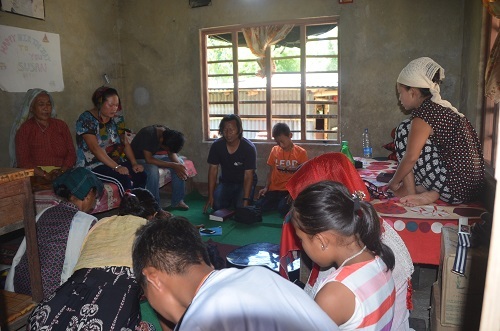 In this above photo, a handful of believers is gather in home to worship the Lord Jesus Christ together with other saints. We all need your prayer so that Church will grow despite restricted rules. I have more on this, below. We have lovely Children in Urlabari. Look at them, they look so happy and healthy. It is because of your prayer and support. If I say thousand times thank you, it will still be less. There are thousands of Children in Nepal, but we are glad we could change some. May your reward in Heaven be great. There are more children who need support like this. 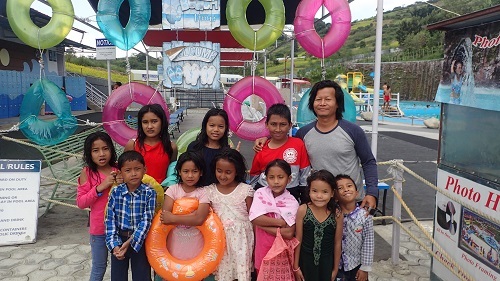 Names of children: Saroj Rai in Red, Ashika Rai in green, Yakesh Rai in behind Saroj, and center back Yashika Rai and me, Reuben in Urlabari, Morang Nepal. We thank you for this team who came and help us in Nepal to extend the orphanage. We pray and expect more teams to visit and help us in needed project. Teen Mission who came to help build orphanage kitchen enjoying their time in National Park in Chitwan, Nepal. We were able to witness the crowd with message of the good news in Far East Nepal. Soccer is the most loved game in Nepal and in this mountain town, thousands of people came to watch the game. 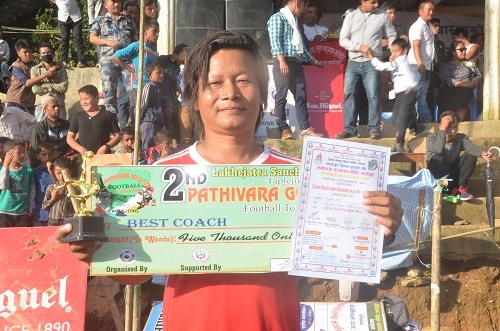 God is leading this soccer ministry all around Nepal and people are reading the news of the Church Boys team in TV, Radio, Newspaper, and internet Media. Where ever we go and play, we give glory to God in the sporting field. We had two trophy in September October. This one is from Taplejung. Here is Peter Segun from Nigeria who play very good defense role in football. Name of Christ is lifted up. We thank God for using us in sport. People start to talk about Jesus Christ where ever we go. They say this is a Church team, this is very good team, players are sober, gentle and they ask us about our faith. Children were so happy to visit the whoopie land during the great festival in Nepal. Christians are minority in numbers, and we are surrounded by Hindu tradition. We do not want our Children to feel lonely in festival, so we took them to Whoopie land. Raising Children is very big responsibility. When I was child I never had chance to visit any of these park. Children we care today are privileged children. They have good food then we did, good clothes then we and they have chances to visit national parks and whoopie lands and zoo. This is because of your support and thank you to you all for your love. I want to thank all friends and partners for giving me opportunity to serve Children. After the Earthquake my ministry has been dramatically changed for the good. We rescued Children and studying now and hope they will have better future. There was huge damage done by the flood that effected South Asia. It was short flood but the damage done by it were huge. 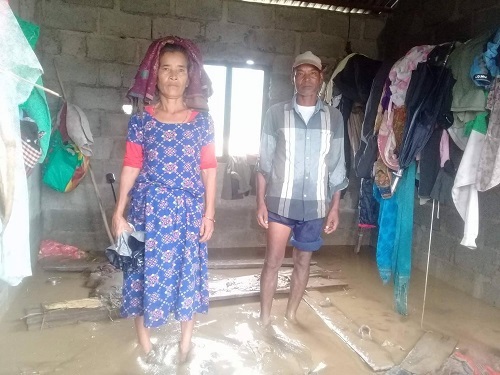 People had to leave home at night and some people who were not aware were victims of the rain and flood. Nearly 200 people dead in flood, mostly children. Their crops were damange, house destroyed. Many Churches responded to the need with relief supplies and share the gospel to them. There are some serious cases of post flood situation and we are trying to reach there with some help. So it is not over, there is a chance to help them. Please join with us to give them help supplies. Be a part of God's work in Nepal. President of Nepal sign Anti Conversion Law to be effect in Nepal, so we need your prayer for Nepal, for Pastors, Evangelists, Church workers, many seems likely to face the prison because no one can stop the gospel being preached in Nepal. Nepal makes new rule to threaten and punish Christians who preach and people break the rule all the time. Is not this beautiful? Nepal is small country in the world and grace of cloud is over this country, that is why, thousands of people accepting Jesus Christ every week and church is being planted every months all around. I have some more pics below that I was unable to insert in post. I hope you like them very much.